The essence of Dave Goodrich's music is an unembroidered reflection on life's many journeys and the search for the answers to the questions we have all asked ourselves. BUT IT ROCKS, TOO! 15 Minutes, his current release on BQE Records, L.C., showcases his ability to write, produce, and perform rock music that stirs up the mind and the body. His first fully-produced solo effort, 15 Minutes has received airplay all over the US on college and commercial radio stations. Recently, the album has received play internationally on internet radio, as well as traditional radio broadcasts. It has also been a favorite on websites such as planetjam.com, where it remained in the Top 20 for several months. Dave has received generous reviews from both print and on-line publications. Dave earned his reputation by capturing audiences with his intricate acoustic guitar work and buttery vocals which complement his intimate, intelligent lyrics. Dave Goodrich's career as a musician began early and continued to þourish while he was a music student at SFSU in northern California. He provided drum and vocal support to several bands in the Bay Area, performing in such venues as the Berkeley Square, The Chi-Chi Club and Mabuhay Gardens. The original recordings he produced were the first of his work to receive air-play. 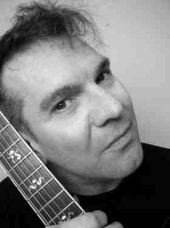 Following the breakup of his Washington, DC-based band Mind's i, Dave Goodrich headed for the solo world as a singer/songwriter/guitarist. Dave Goodrich is currently based in the Washington, D.C. area. Goodrich has entertained crowds as large as 20,000 while playing top events and venues throughout the mid-Atlantic region. His performances and compositions have been lauded by publishers in San Francisco, Nashville, New York, Washington, DC, and Hollywood and by critics wherever he performs. Atlantic recording artist Jewel opened for him at a Washington, DC, cafe in 1995, and Goodrich and Shawn Colvin shared a bill at DC's 9:30 Club that same year. He has also shared bills with Howie Day (Arista), Sheila Nichols (Hollywood Records), and Angie Aparro. In 1997, Goodrich showcased twice--both solo and with a full band--at the Philadelphia Music Conference, where his single "Improper Tonight" was featured on the conference's compilation disk, and he played a critically-acclaimed set to a standing-room-only crowd at Richmond's Route 1 South Music Conference and Festival. Dave continues to perform publicly in addition to causing a swirl of creativity in the recording studio. Currently in the midst of recording his upcoming release World Gone Round, Dave is preparing to once again delight devoted fans and attract new audiences who yearn for a smart new perspective on life and an exciting groove to go along with it.